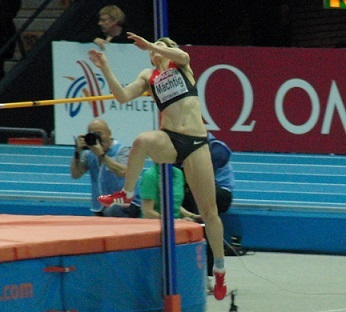 The skill of how to jump higher is important for many sports. You can imagine, therefore, that any improvements you make to this essential ability will pay huge dividends in the competitive arena. Strength in your lower extremities is important when you are trying to get off the ground. You need to apply a great amount of force to the ground to overcome inertia. For example, a person weighing 80 kilos will need the ability to exert forces in excess of 80 kilos to overcome the earth’s gravitational pull. Put simply, the stronger you are, the more able you are at getting off the ground. The extent to which you can apply forces in excess of your body weight is one of the key indicators to how high you can potentially jump. The development of your maximum strength is therefore very essential to improving your ability to jump higher. You can learn how to improve your maximum strength, just go to the article on this site where I discuss strength training routines. Developing maximum strength, as explained above, is not the whole story of how to jump higher. Strength is simply your ability to exert force to move a mass. Mass is usually measured in kilograms or pounds in this respects it represents your body weight. However, in most instances in competitive sport, strength or force must be applied within a certain time frame. For example, sprinting is regarded as an activity that demands a high level of power. Sprinters typically have about 90-milliseconds to apply the force they need to propel themselves across the ground. If all things are equal, the athlete who consistently applies the highest force values in that 90-millisecond time frame will win the race – it is as simple as that! Power is, therefore, the product of both strength and speed. It is the speed at which muscles contract. The more power your muscle can produce, the more potential it has to propel you off the ground. And although pure strength is important in your overall development, the true quality you seek, is the power that your muscle can exert. However, here is a caveat; a weak person cannot be a powerful person! Strength must underpin the development of power. The power to jump higher can be developed utilizing two modes of training, weight training using very specific loads such as the example given in the articles strength training programs and plyometric exercises. Both will elicit improvements in the numbers of muscle fibers recruited for a given activity and also improve your rate of force development. However, it is not until you make full use of the very special benefits of plyometric training, which utilize the stretch shortening cycle that you will see your power output for jumping higher literally skyrocket. Both maximum strength and plyometric methods should be used if you are to get the best results of how to jump higher. Taking heed of the two training methods on how to jump higher and putting them into a well-planned training program, will guarantee your sucess. From "Learn How To Jump Higher - Gauranteed" Back To "Faster, Stronger, Better – Your Shortcut To Improved Athletic Performance"